This week the world was deeply saddened by the loss of another talented and inspirational individual. When we contemplate the life of Robin Williams many will remember him as a character in one of their favourite films – often hilarious and outrageous. We likely imagined his successful Hollywood career was accompanied by a life filled with laughter, fun, adventure and happiness. It seems almost inconceivable that he would fall prey to a crippling condition like depression. The stigma once attached to depression, that left many suffering in silence, is thankfully subsiding as our understanding of this complex condition is evolving from both a medical standpoint and from within society itself. Many individuals in the public eye have courageously spoken out about their personal battle with depression to help raise awareness of its severity. We are beginning to understand the idiosyncratic nature of depression and those standing on the outside of the situation have come to accept that maybe we’re incapable of providing a solution to loved ones who suffer from it. You might be asking yourself what does Fitter Food have to offer here? Surely something so deep rooted, subjective and psychological cannot be addressed by food! Whilst we certainly don’t claim any miracle cure here there have been some interesting developments in the scientific literature regarding neurological disorders. Studies have observed how nutrition and lifestyle interventions may alter our biochemistry and influence gene expression to exert a powerful protective effect that actually supports and strengthens our psychological disposition. Whilst conventional medicine has focused on eliciting an antidepressant effect via pharmaceutical drugs that will improve our levels of feel good brain chemicals like serotonin. There is actually a lot of information suggesting we can make a significant difference to how we think and feel by what we eat and do. Not the gut again?! Yes the gut again. We talk in the Paleo Primer about the way in which many modern day foods can damage our digestive tract and lead to a condition commonly known as ‘leaky gut.’ Foods, chemicals and bacteria can escape into the body and cause the production of inflammatory chemicals, these in turn act as an alarm signal to our immune system and gear it up for a full on fight. What does this have to with depression you might be asking yourself? Studies have observed how these inflammatory chemicals can actually pass the blood brain barrier, a strong fortress around our brain designed to protect it from infection and damage. When these chemicals cross into the brain they may suppress neurological functions and lead to the symptoms of depression. Furthermore, the majority of our serotonin is produced in our digestive tract. Scientists are still exploring how gut serotonin interacts with brain serotonin but again there’s a strong suggestion here that a happy gut = healthy serotonin production and stable mood function. Chronic stress can increase your risk of developing depression. When we detect a physical or psychological threat our bodies react immediately producing up to the 30 hormones instantaneously. Stress hormones such as cortisol and adrenaline target certain areas of our brain, particularly the prefrontal cortex and the hippocampus region which are involved in cognitive behaviour and memory processing. Any stress; such as being late for work, traffic jams, deadlines, family dramas will impact upon your brain’s ability to process information. However, our brains actually do their best to buffer and adapt to stress and it doesn’t necessarily cause depression in everyone. Studies are investigating how some people may carry a particular gene that influences their serotonin production, and when combined with chronic stress puts them at high risk of depression and other cognitive disorders. These offer numerous health benefits but it’s increasingly looking like therapeutic measure to protect against mental health issues is the way forward. Chris Masterjohn has written extensively about the links between nutrition and building a foundation for robust metal health. Following his own experience with vegan nutrition he has explored the associations between anxiety, obsessive compulsive disorders, depression and vegetarian/vegan diets. Whilst he’s cautious to suggest any causative relationship he suggests that key nutrients lacking in vegetarian nutrition may predispose you to compromised mental health. In particular, vitamin B12 and folate found in meat, poultry, eggs, cheese and milk, along with B6 all play an active role in determining levels of something called homocysteine in the body. The nutrients that lower homocysteine are listed below along with the richest food sources. Thus including these within your nutrition will help keep inflammation in check and support more stable mental health. It builds a strong case for eggs for breakfast. Folate Romaine lettuce, spinach, asparagus, mustard/collard greens, liver, eggs, parsley, broccoli, cauliflower, lentils. Or in layman’s terms every high is followed by a low! These stimulants and mood hijackers have to be ditched if you’re predisposed to low moods, anxiety and episodes of depression. We often advocate a 30 day abstinence period from all the above to help you regain control and mood stability. Easier said than done we appreciate and recommend you seek professional support from either a Nutritional Therapist, Functional Medicine Practitioner or an addiction specialist if this is a personal battle for you. Exercise has been shown to increase serotonin production in the body elevating our mood, motivation and positivity. In particular aerobic exercise like brisk walking, cycling and jogging. Yoga is also highly effective. What’s interesting is that too much exercise or forcing yourself into exercise you dislike doesn’t improve symptoms of depression so if you hate your Monday night bootcamp class it might be time for a rethink and find an acitivity you enjoy and look forward to each week. The important thing is that you MOVE and enjoy it. Getting outdoors also enhances the therapeutic effect of exercise. Exposure to natural daylight and fresh air increases production of serotonin and of course tops up our vitamin D stores. Optimal levels of vitamin D (get your GP to test) are hugely important as deficiency is associated with depression. To gain the most benefit try and have multiple sites of your skin exposed daily when you head outside as we absorb vitamin D through our skin. Exercising barefoot could also prove beneficial given it’s impact on reducing inflammation in the body, read more here. Also timing is important, try to expose yourself to bright light first thing in the day and throughout the day to enhance serotonin activity. In the evening it’s best to decrease our light exposure by using lamp lights and minimising time exposed to artificial lights; such as TV’s, laptop screens and mobile phones. The darkness will feed a message back to the brain that the day is over and encourage the production of your sleep hormone melatonin, vital for a good night’s sleep. Foods that support serotonin production include adequate carbohydrate consumption, experiment with around 100-150g daily. Sweet potatoes and white potatoes are an awesome source as they also provide lots of B6 (to help keep Homocysteine in balance). 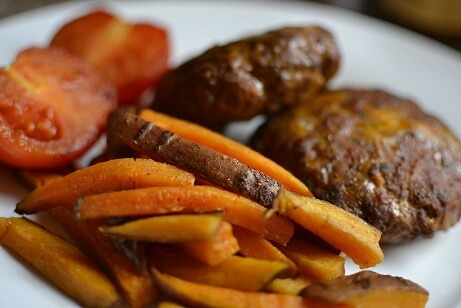 Also foods high in the amino acid tryptophan (a precursor to serotonin) such as turkey, eggs, chicken and nuts can also promote healthy mood function, check out our Turkey in a Sweet Potato Bun as the perfect combo of the two. Without doubt a key change you can make to your nutrition is to EAT MORE FISH. At least 3-4 servings of oily fish each week. Research clearly demonstrates that depressed individuals tend to be low in Omega 3 essential fatty acids found in fish and seafood. These fats are fantastic for reducing inflammation and improving hormone health but have also been shown to help stabilise mood and prevent depression. It is the docosahexaenoic acid (DHA) component that really helps support optimal brain function and for some individuals prone to depression considering a daily fish oil supplement may be helpful. Ensure you chose a pharmaceutical grade fish oil that has been filtered for heavy metals and toxins; Eskimo, New Chapter, MorEPA and Biocare are reputable brands and both Minami and Nordic Naturals offer capsules with extra DHA. Wild fish has higher levels of omega 3 fats and tinned fish can be incredibly healthy as you consume the skin and bones offering higher levels of glycine, vitamin D and other nutrients. 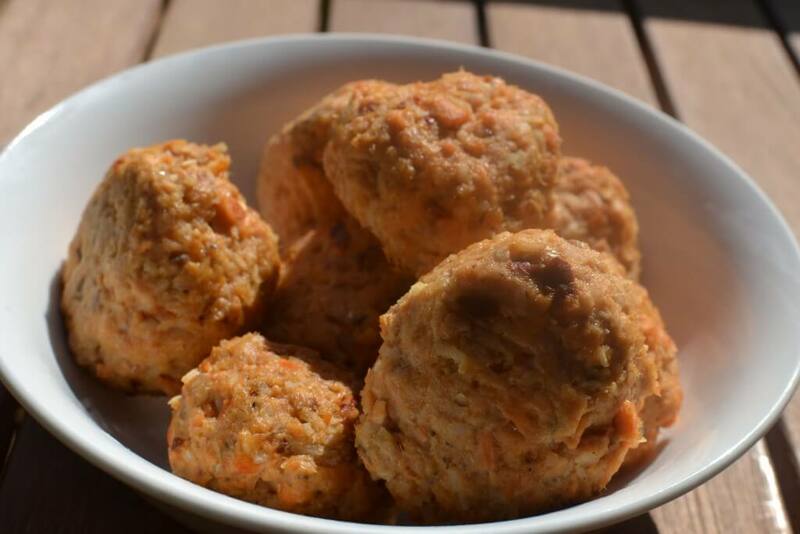 Thai Omega Balls are our most successful attempt yet at getting more omega 3’s onto anyone’s plate. It’s also very important to limit your intake of Omega 6 fats as the two will compete in the body so margarine, vegetable oil based salad dressings and cooking oils should be avoided. May sound obvious but we spend a lot of time surrounded by people that don’t make us feel that good. Matt has written about what he calls ‘radiators and drainers’ in life, ensure you spend time with people who are there for you and bring out the best in you. There are also numerous options available for professional advice regarding emotional issues and depression including cognitive behavioural therapy, life coaching and counselling. Most importantly, never hesitate in seeking help – it can make a huge difference to reach out and gain the support of someone outside the situation.